I’ve created many opt-ins but this one created when I relaunched my website converts like crazy. It generated 128 leads in 20 days with ZERO paid ads. 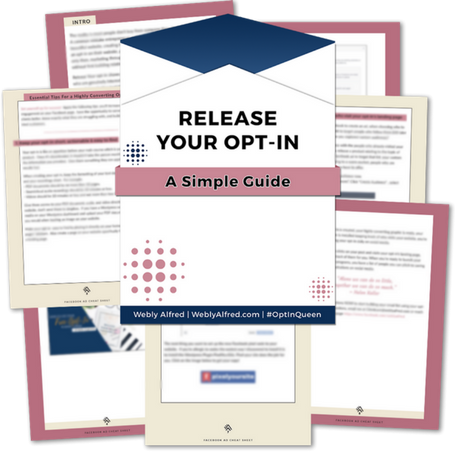 An opt-in is free information you provide that answers one question, solves one problem or provides a concrete example in exchange for access to someone’s inbox. The single biggest mistake newbie online entrepreneurs make is to launch a new website then start working on their first product. “Money loves speed,” but if you have no idea who this product is for, whether or not they need this product, you are speeding to a place of frustration with zero sales when you finally launch a product. Before you dive into the opt-in examples, have you identified who your ideal customer is, your customer avatar as commonly called? 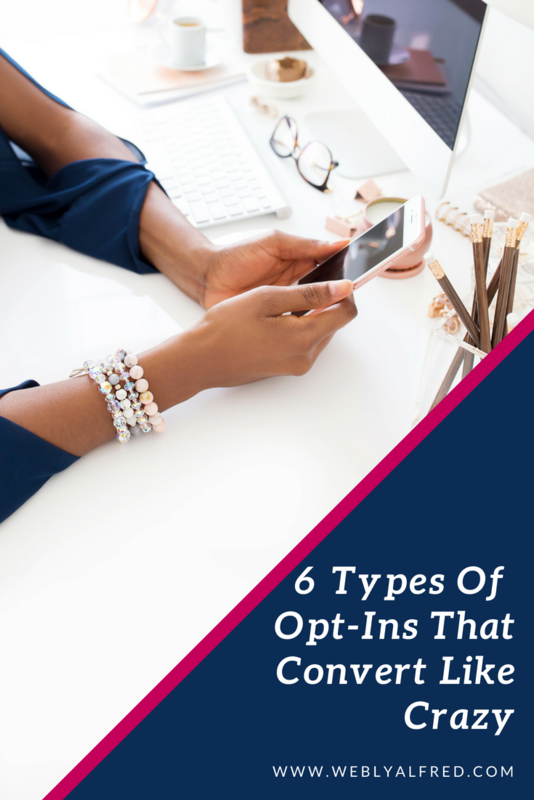 Identifying who your ideal customer is, is the first step in creating highly converting opt-ins. You first need to know where she is in her business, what she already knows, and precisely what she will buy from you. I’ve made this easy for you. I’ve prepared a freebie that helps you determine who your customers are, where they’re hanging out and what they will buy. Now, let’s look at six examples of opt-ins who do it right. 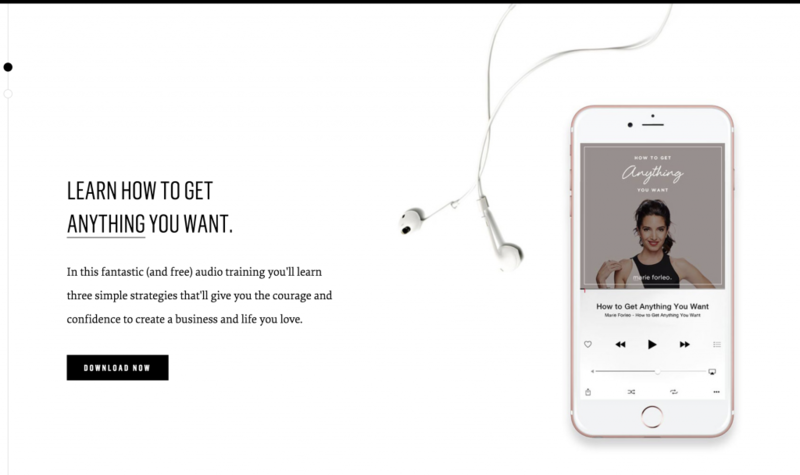 If you’re a natural talker, you show up regularly on social media doing live streams; it makes sense like for Marie Forleo to use audio training to persuade people to learn strategies that will help them create a business and life they love. Ultimate guides are very common lead magnets. The most useful ones are incredibly detailed, provide a guide or serve as a cheat sheet that people can use as a reference. Here’s an example from Bushra Azhar’s The Persuasion Revolution. Everyone loves a significant discount because they are the perfect instant gratification and an easy way to sample doing business with you. If you have an e-commerce store selling clothing, accessories, oil, hair products and more, discounts are ideal in exchange for an email address. 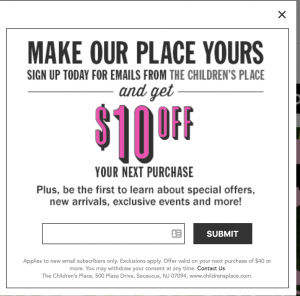 The Children’s place offers all their first-time customers a $10 off plus free shipping if you purchase for a certain amount of money. The common denominator with all six examples is that they relate to a product that is offered. The visitor listens to the audio training, downloads the guide, gets a $10 discount, tries a meal plan for 7 days, and finds out her relationship with money with zero strings attached. These opt-ins solved a specific problem in exchange for an email address. It is that simple. REMEMBER: Your opt-in doesn’t need to take weeks to create, it doesn’t need to be 30 pages long, or take 30-days for anyone to consume. It needs to solve one problem with a specific solution for one particular person. The key is to start with identifying this person. 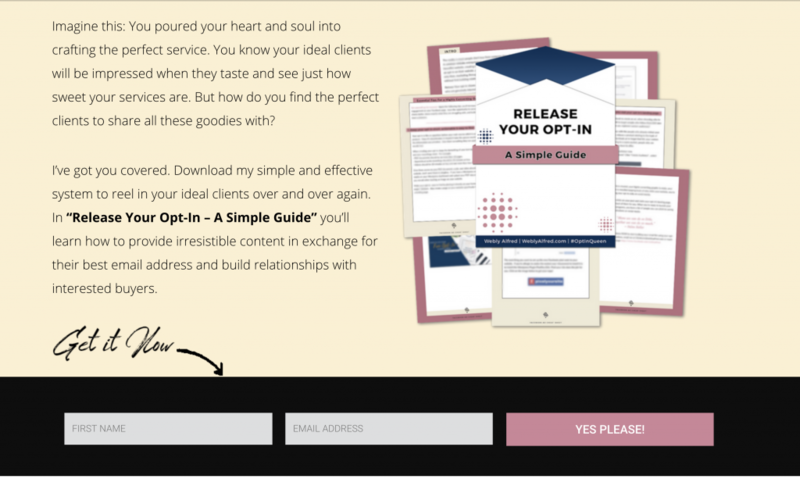 All of these are great examples of easy to create opt-ins that entice people to signup! I’ve been using a free book chapter, as when we created my site, that seemed like a teaser to introduce people to my book. I also created a PDF that is only available when I participate in list building promos. As someone who LOVES quizzes, that would probably be one I would try next! Thanks Webly! Book chapter freebies are actually one of my favorites. It’s a great incentive to purchase the rest of the book. Great call Beverley. Thanks for all these opt in examples. I especially like the quiz concept. Never would have considered it but can see how it would convert well. I Use two right now that work very well. One gives the client a ring sizer template and the other gives them helpful ways to wear a copper cuff. Love your freebie ideas Alene. Webly, this is timely for me. I’m ready to change my gift and love the ideas you give. Your website is beautiful! That’s wonderful Candess. I was watching your healing video for pets, I think a mini-series (3 videos) of that would be an amazing freebie. I had no idea this is something that we can provide for our furry family members. 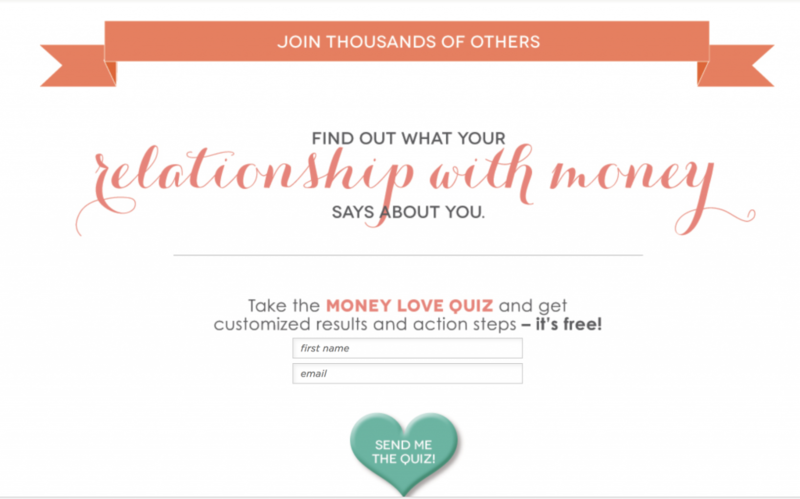 We created an opt-in that I loved initially. I then realized that the journey we created wasn’t quite right to lead visitors from first-time viewers to paying clients. We pulled it to make some tweaks to our plan once summer is over. Rachel, I believe that’s one of the best ways to get to know our target audience. If they don’t respond to where your opt-in should lead them, then it needs to be tweaked. Great call! I SO love this article, Webly. I’ve been listening to a lot of different people on optins and this article outlines the different EFFECTIVE ways to do this nicely. Thanks so much! I am happy Tandy that this article was useful to you. These are all super ideas, Webly. Before I redesigned my website, I had a bunch on them available. Now…well, they probably need to be refreshed. Thanks for the goose! I am with you on refreshing them Jackie. I’ve had to do that a couple of times and at the rate everything is changing online it should be part of our strategy. Hi, I’m Webly. My passion is working with determined entrepreneurs who are ready to dominate their websites, grow their potential client list, and nail it on social media so they can start focusing on the core of their business. 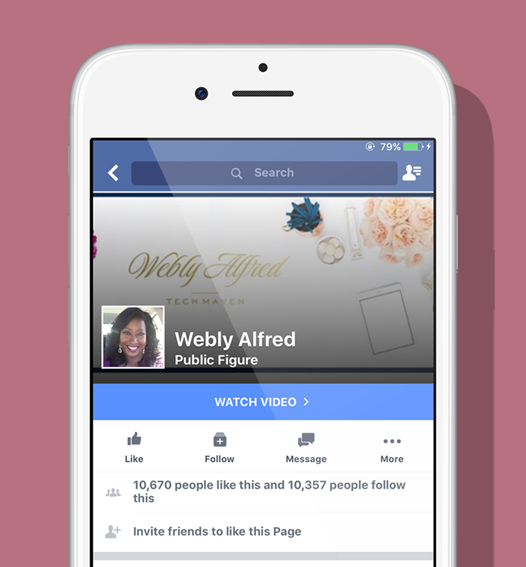 How to know where your ideal customers are in as little as 10 minutes without spending money on Facebook ads. Please keep me posted on new trainings, free tutorials, and time-sensitive deals.